This winter, I am wearing a wolf fur hat with a thriftstore sheepskin coat. Not only it is warm, this hat also conveys very well the dual nature of the humankind. Even those who identified themselves as 100% wolf always have an inner sheep deep inside of them. And beware of those who appear to be mostly sheep. Like everything else, it’s a question of balance. But still, you can’t wear a wolfskin hat all the time. It gets smelly when exposed to too much rain, and I’ve been told it’s not good for your hair. One recent sunny afternoon in Bushwick I was taken by my friend Corinne, who runs Mc&Co this great store in Williamsburg where I got my tote bag from, to Lola Ehrlich’s studio on the top of this industrial building with an incredible view of the distant Manhattan skyline. 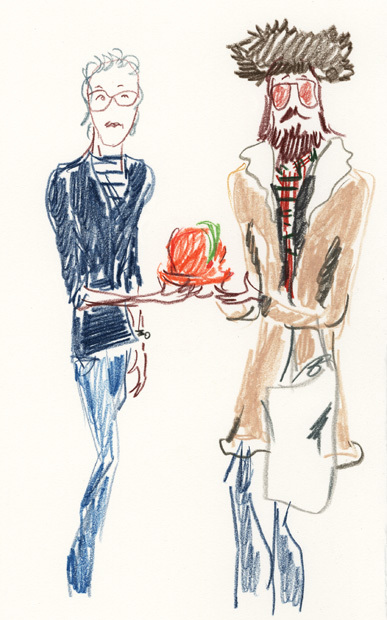 Lola is the designer behind John’s distinctive hats. 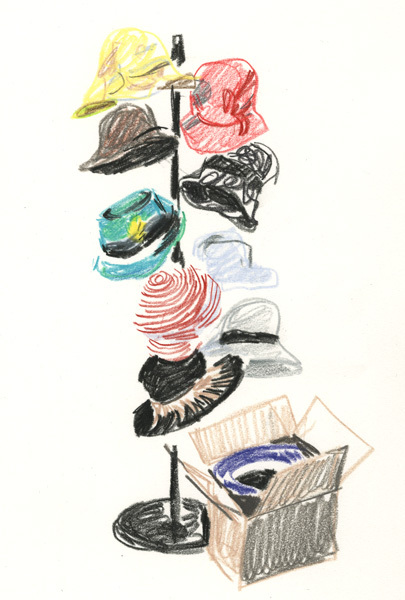 There were hats of all styles, shapes, and colors hanging in bunches like grapes from the ceiling, or on racks like fruits growing on trees. 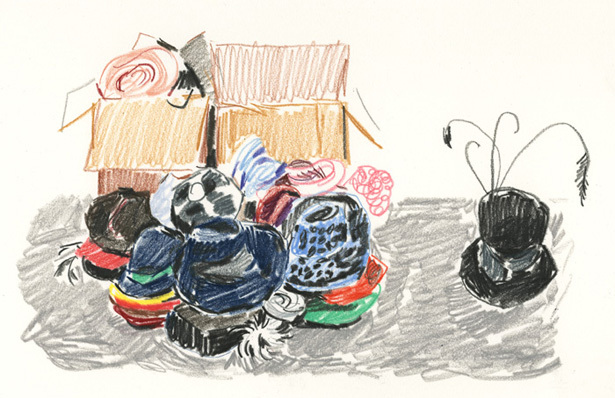 There were hats on top of hat boxes, hats on suitcases, hats on stacks of second-hand books, and even hats on the floor. 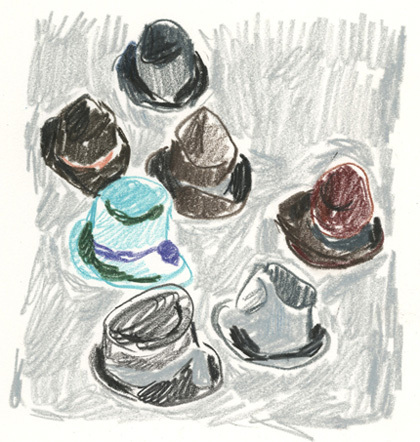 It was like one of Maira Kalman’s drawing coming alive, a secret cavern where treasured hats are stashed. And they were all speaking to me, like funny characters, under no principle of certainty. 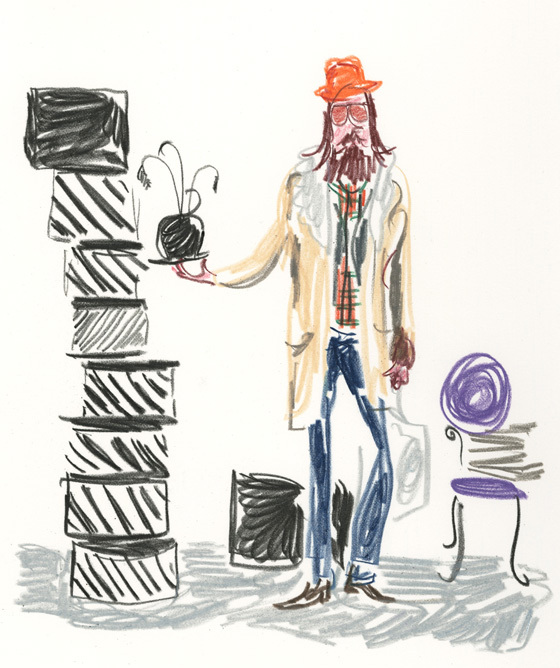 Unlike helmets, designing hats is a poetic thing. Lola’s parents were so truly bohemian that they wouldn’t allow their daughters to go to school, probably in fear of seeing them turn into squares. 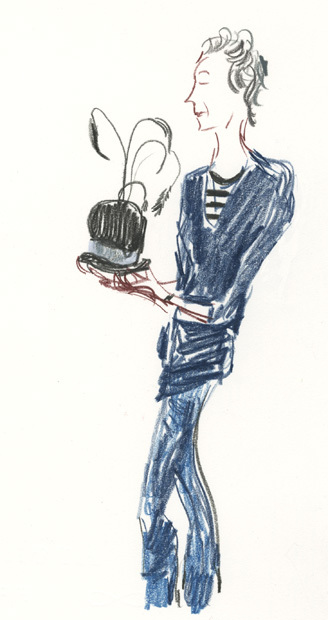 As a teenager Lola trained as a ballet dancer and it can be still be seen in the way she stands, which sometimes looks like a feather balancing on top of a hat. I wanted to pick up an orange rabbit fur hat, as an occasional substitute for the wolf fur, but without a word Lola gently handed me a brown felt fedora. After all, I’m a self-taught hipster, and can still make mistakes.